This test pressing has white PRC labels. Mick Stevenson (2011) has a picture of a label in his book with handwriting. The printed part on the label says "PRC Recording Company, 1600 Rich Road, Richmond, Indiana, 47374, Test Pressing, Selection No". 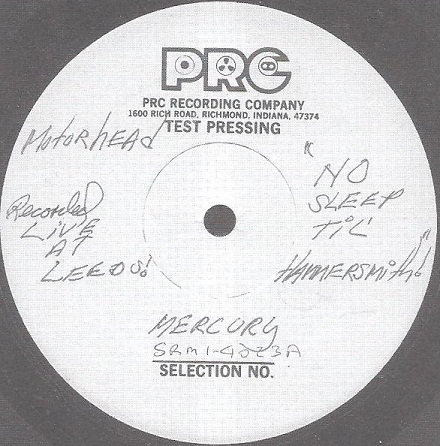 The handwritten part says Motorhead, No Sleep ´til Hammersmith, Recorded Live At Leeds, Mercury, SRM 1-4023A". There are also Presswell test pressing, which is not so strange considering there are 3 different labels for the stock copy which indicates they have used different pressing companys. Oliver Kaempf, Mick Stevenson (2011).